It’s a funny picture because it reveals a truth. Your clients want to produce bigger outcomes but they resist spending the money to produce those outcomes. It reveals another truth for those brave enough to accept it: You have to help your clients spend the money they really need to spend–even when they don’t want to spend it. Some of your prospects want outcomes that they literally can’t afford. But more of your dream clients can afford the outcomes they want, they’d just rather not pay for them if they don’t have to. That means it’s your job to tell them they have to. The first part of negotiating isn’t about the price. The first part of negotiating is about the value you create, the outcomes you are going to deliver. Your dream client is always going to ask you to sharpen your pencil. But you should sharpen your value instead. Your job is to help your dream client get what they really want. They really want the outcomes that you helped them discover as you worked with them. They also really want a lower price. It is your job not to be torn between these two desired outcomes. It is your job to help them make the right investment, the investment that will deliver the results they need. 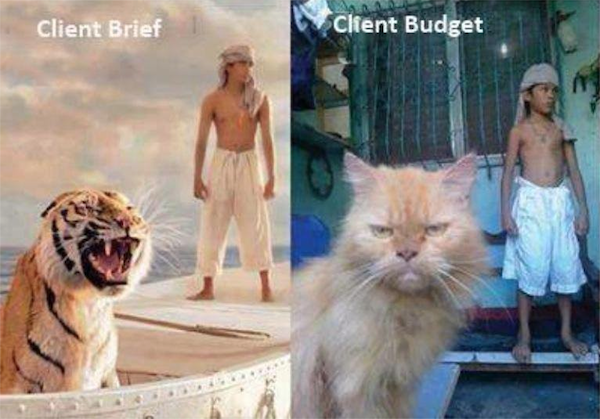 You have to help them be the tiger in the client briefing picture, not that frazzled alley cat in the client budget picture. Do you have clients who need your help making the right investment in the results they need? Have you failed a prospective client in the past by allowing them to choose a competitor at a lower price only to lose the results they could have had? Who do you need to help make better investments? What conversations do you need to have? Reply to send me your stories, thoughts, and ideas. You know what you need to do this week, so go bravely tackle it!